Florence is expected to blow ashore Saturday morning along the North Carolina-South Carolina line. WILMINGTON, N.C. — People who thought they were safe from the onslaught of Hurricane Florence began boarding up and Georgia's governor declared a state of emergency Wednesday as uncertainty over the path of the monster storm spread worry along the Southeastern coast. Hurricane Florence Wednesday 11 a.m. ET update. As of 2 p.m. Wednesday, the National Hurricane Center showed Florence as a Category 3 storm with maximum sustained winds of 125 mph moving west-northwest at 16 mph. 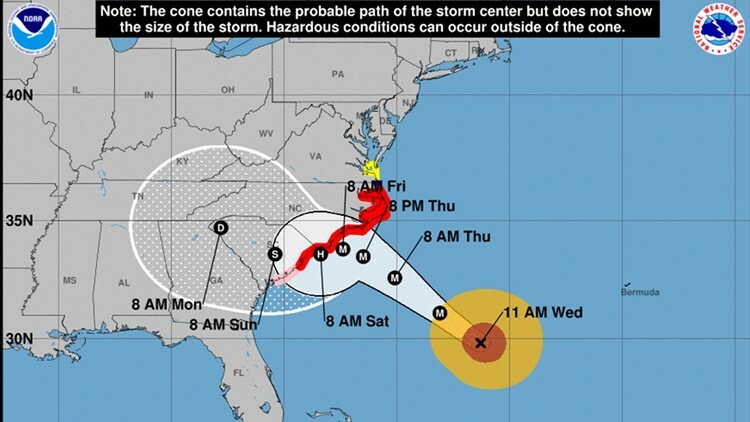 The storm was about 435 miles southeast of Wilmington, North Carolina and 470 miles east-southeast of Myrtle Beach, South Carolina. Florence has the potential for 1 to 3 feet of rain in places — enough to touch off catastrophic flooding and an environmental disaster, too, if the water inundates the region's many industrial waste sites and hog manure ponds.